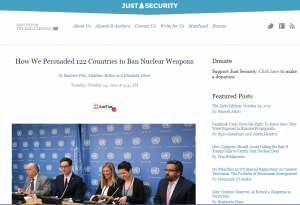 In an article for Just Security, Director of the International Disarmament Institute Matthew Bolton and two leaders of the International Campaign to Abolish Nuclear Weapons (ICAN), Beatrice Fihn and Elizabeth Minor, examine the 2017 Nobel Peace Prize-winning advocacy effort culminating in the negotiation of the Treaty on the Prohibition of Nuclear Weapons. ICAN’s strategy was primarily a discursive one. We aimed to change the way that people talk, think and feel about nuclear weapons, changing their social meaning from symbols of status to outdated, dangerous machines that have repulsive effects. Representatives of the nuclear-states often marginalize those calling disarmament by dismissing them as deluded. In her protest outside the room where states were negotiating the TPNW, US Ambassador to the UN Nikki Haley chided them, saying “we have to be realistic.” However, ICAN campaigners called attention to the discrepancies between these claims to “realism” and the mystification that surrounded these nuclear weapons. To change how nuclear weapons were discussed, we brought nuclear weapons into new arenas where humanitarianism, human rights and environmentalism are regular conversations, and to inject these discourses into traditional nuclear forums. We demanded from states the meaningful participation of survivors, affected communities, medical professionals, faith leaders, humanitarian agencies, activists and academics in the nuclear conversation. We pointed out when forums and panels excluded women, people from the Global South and those who have experienced nuclear weapons’ effects.